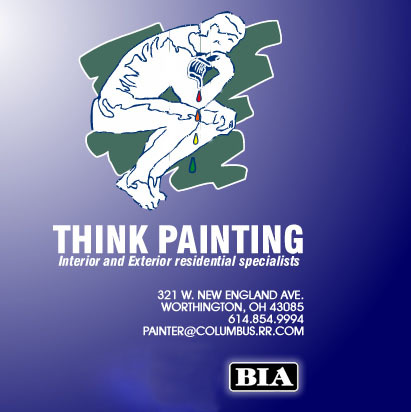 Think Painting is a full-service painting company located in Worthington, Ohio specializing in interior and exterior residential work. Our professional, experienced staff pride themselves on providing outstanding customer service and a superior quality of work. See? 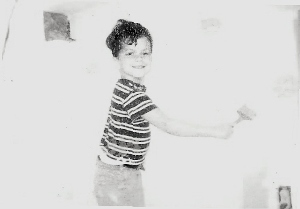 Mike's been painting in Worthington since 1967! Unlike other companies, Think Painting does not sub-contract our work to other companies. All members of our experienced staff are full-time employees who have chosen a career with Think Painting, receiving benefits including health coverage, retirement plan and worker's compensation. Think Painting is fully insured against any accident that may occur to you or your property. We are members in good standing with the Business Bureau of Central Ohio, and are members of the Worthington Area Chamber of Commerce. If peace of mind is what you seek for your painting projects, then THINK PAINTING! "Our thanks for the GREAT job you did on our family room, bath room, dining room, kitchen, and living room. Our house looks the best it ever has in our 28 plus years of living here. We WILL be calling you in the near future to paint our bedrooms. Thanks again. "